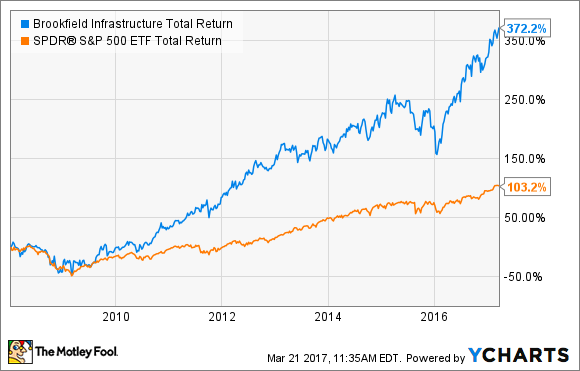 Here's why Brookfield Infrastructure Partners and Home Depot could be terrific investment candidates for older investors. While investors in their golden years need to be more conservative with their investment choices, they shouldn't shun the stock market altogether. Below is a look at two stocks -- Brookfield Infrastructure Partners (NYSE:BIP) and Home Depot (NYSE:HD) -- that have proven business models and generously share their profits with their shareholders. That makes them ideal investment candidates for older investors. As its name implies, Brookfield Infrastructure Partners is a publicly traded partnership that focuses on owning and operating infrastructure assets. The company's portfolio spans the globe and includes electricity transmission lines, toll roads, shipping ports, cellular towers, oil and gas pipelines, and more. Why does Brookfield favor infrastructure assets? The reason is that these assets are critical to modern-day living and are mostly one-of-a-kind. That means that they face little to no competition, allowing Brookfield to generate predictable cash flow even during periods of economic upheaval. In turn, Brookfield gets to pass along an ever-growing stream of profits to its investors. Looking ahead, management believes that its asset base and investment opportunities will allow the company to grow its distribution by 5% to 9% annually. That's a strong number for a company that currently offers investors a yield of 4.7%. The only downside to owning shares in a limited partnership is that there are special tax ramifications that need to be considered. However, I think the potential for a big yield and dependable growth more than offsets the extra hassle at tax time. The ever-present threat of online-only retailers has turned the retailing world upside-down. The changes have caused many retail concepts to go belly-up while others are rapidly closing stores to rightsize their businesses. However, not every retailer is struggling to adapt to shifting consumer habits. Home-improvement giant Home Depot continues to post strong quarterly results, which show how well-positioned the company is to thrive in the 21st century. Home Depot's success can be traced to at least two factors. The housing market continues to recover from the downturn, which is driving increased demand for home renovations. Meanwhile, Home Depot's knack for attracting new customers to its stores is helping it to gain market share. With these factors combined, the company is having no problem increasing same-store sales at mid-single-digit rates, which are numbers that most retailers would kill for. Management isn't resting on its laurels, either. The company has been investing in its digital business for years, helping create a differentiated shopping experience. Consumers can now order products online and choose to have them delivered at home or picked up in-store. Using this avenue saves them from having to wander the company's stores in search of a specific product. In addition, consumers can return items that were purchased online to their local stores, saving them shipping costs. Those are nice benefits that online-only rivals can't match. These moves are clearly working, as Home Depot's e-commerce sales rose by 19% and now comprise 6% of total sales. This trend should continue as more consumers realize the benefits of shopping online. Given the company's flourishing financial statements, management has turned its attention to rewarding shareholders. The company just raised its dividend by 29% and shares now yield 2.4%. The board also gave the green light to a new $15 billion share-repurchase program, which should help to chip away at the company's share count. Home Depot continues to look positioned to thrive. While shares are trading near an all-time high, the company's trailing price-to-earnings ratio is only 23. Meanwhile, market watchers believe that Home Depot's earnings per share will grow by more than 11% annually over the next five years. I'd argue that growth rate makes the company's current valuation quite reasonable, especially since this is such a high-quality business.